Description: Absolutely stunning home w/gorgeous wood floors thru out downstairs, oversized tile floors in bath & lush carpet! 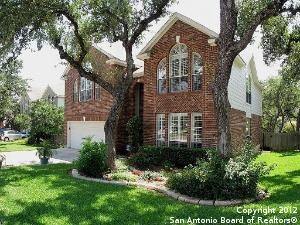 Open kitchen w/granite counters, huge island, 42 in oak cabinets, built in desk & breakfast bar that overlooks family room! Formal dining has built in granite dry bar w/drawers! Crown molding thru out down & chair rails & wainscoating! Plantation shutters! 12x24 professionally covered patio that overlooks lush yard & majestic oaks! Awesome master retreat, deep jetted garden tub, sit down shower!